Live the Dream! You will enjoy the best in updated Florida living, all on one floor, in this 3 Bedroom / 2 Bath, 1,540 HSF + 2 Car Garage Home. With an open floor plan, an updated kitchen and bath and views to the large back yard and canal you will enjoy mornings on your patio and plenty of room for a pool. Your boat is safe on a new 16K Boat lift, and a large dock with protected harborage on a deep-water canal. 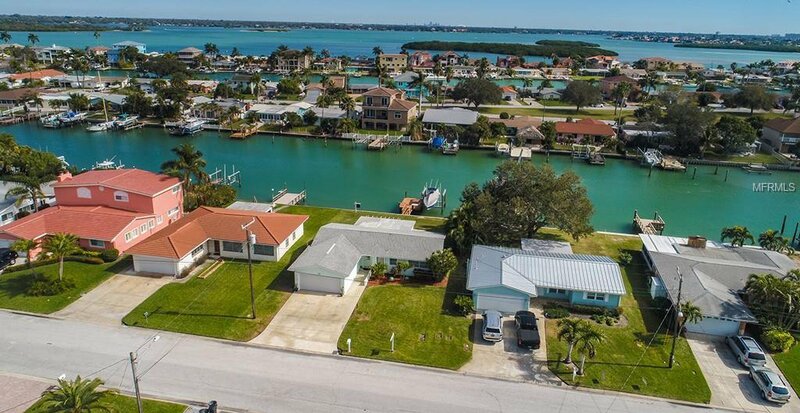 Travelling by boat, you are just minutes from Johns Pass and the Gulf of Mexico or local boat trips to any of the many waterside dining and entertainment venues. A short ½ mile walk to the beach and limited access to the Crystal Island subdivision are even more reasons to enjoy the island. Madeira Beach is centrally located along some of Florida’s best beaches. Easy and quick access to St Petersburg’s downtown museum and arts district is just the beginning. You are just 30 minutes or so to Tampa International Airport via I-275. Tampa’s many professional sport’s venues and proximity to some of the world’s most famous theme parks, aquariums, and zoos all provide action and entertainment for all. Listing courtesy of CENTURY 21 BEGGINS. Selling Office: CENTURY 21 BEGGINS.